Ulfat Khaider is the fascinating star of the video below on the subject of co-existence co-existence in Israel in general and Haifa in particular. She has reached high peaks not only as a mountain climber, extreme sportswoman and volleyball player (she played for the Israeli national team), but as a remarkable woman striving for peace. Ulfat is a project manager at Beit Hagefen, a Jewish-Arab cultural center in Haifa. Self-defined as a person searching for peace with herself and with others, she promotes projects that bring Jewish and Arab students closer together. Ulfat uses extreme sports, mountain climbing and nature programs to install positive values in young Israelis. An unmanned aerial vehicle was succesfully brought down by an Israel Air Force fighter jet off the coast of the northern Israeli city of Haifa. An unmanned aerial vehicle (UAV) attempted to violate Israeli airspace from the north at approximately 2 p.m. on Thursday, April 22. The UAV was tracked by IDF ground and aerial surveillance for the duration of its flight path as it attempted to approach Israel's coast. Israel Air Force aircraft intercepted the UAV and successfully downed the target five nautical miles off the coast of the northern Israeli city of Haifa. 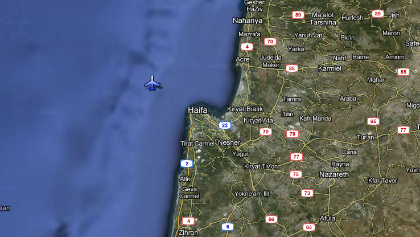 IDF naval forces are currently searching the area. This is the second time in the past seven months that a UAV has been intercepted in Israeli airspace. UAVs pose a serious threat to the State of Israel's security. The IDF will not tolerate any attempt to violate Israel's sovereignty or harm its security. In October 2012 the IDF downed a UAV over the northern Negev. The UAV had infiltrated Israeli airspace from the direction of the Mediterranean Sea. The craft was identified by IDF control systems and was tracked for the length of its flight path in Israeli territory by ground and aerial surveillance, including IAF fighter jets. After several minutes, the craft was successfully brought down in the northern Negev desert, to avoid potential harm to a populated area. During the Second Lebanon War in August 2006, Israel Air Force fighter jets intercepted two Ababil UAVs launched by Hezbollah toward Haifa. The UAVs were located and identified by the IAF's northern air-defense and aerial control units before it managed to cross the border from Lebanon into Israel. The UAVs were downed by F-16C fighter jets – one fell in the Mediterranean Sea in Lebanese territory while the other was taken down north of Haifa. Our University in Haifa is an amazing cosmopolitan campus. Two students from the International School felt that they should record their feekings and those of the students in film. The two students won 1st place in video compwetition. Gaza’s ‘Al-Aqsa’ television channel, which is affiliated with Hamas, continues to faithfully serve the fundamentalist line of its political masters. The channel frequently calls for the violent killing of Jews and for popular struggle against the ‘Zionist regime’, until it has been completely destroyed. Religious leader Wael Al-Zarad asks God to support global Jihad fighters in their attempts to “liberate Haifa, Acre, Jaffa, Safed and Lod, Ramle, Jericho and all of our cities” from “this group of cancerous bacteria” [Israel]. In a Friday sermon from Gaza broadcast on March 1, the preacher calls on his congregation to “admit and proclaim to the entire world that what we truly seek is to remove the so-called “State of Israel” from existence”. The anchor of an Al-Aqsa TV news show reports that Hamas has called for a terror attack on Jerusalem. Hamas proves once again that its claims to legitimacy and moderation are false. Hamas’ true goal is to destroy the State of Israel. We are rapidly approaching a time when it will be easier to list those British establishments that have not gone halal. Schools represent merely the tip of the Shari'a-compliant iceberg. From supermarkets and restaurants to hospitals and sports venues, many food providers serve halal items without bothering to inform the people eating them. On the eve of Israel’s 65th year of independence, the population of Israel has exceeded the 8 million mark with current forecast of 8,018 million. With the establishment of the State of Israel in 1948 the population was only 806,000 inhabitants. "Others", which are non - Arab Christians, other religions and no religious affiliation 318,000 inhabitants (4.0%). The total population of Israel increased since the 64th Independence Day, by 138,000 - an increase of 1.8%. During this period, 163,000 babies were born and 41,000 people died. The number of immigrants who came to Israel was 19,500. At the end of 2011, over 70% of the Jews were native Israelis - born in Israel (more than half were a second generation in the country), compared to 35% in 1948. In 1948, Israel had only one city with more than 100,000 residents - Tel - Aviv - Jaffa. Today, 14 cities number more than 100,000 residents, of which six with over 200,000 residents: Jerusalem, Tel - Aviv - Jaffa, Haifa, Rishon Lezion, Ashdod and Petah Tikva. South Sudan, as a predominantly Christian country, established its independence in July 2011 and since then Israel has made significant contributions to its development. In fact, Israel was among the first nations to recognize the world’s newest nation, South Sudan in 2011. The start-up of South Sudan has been compared to the early years of Israel; to the people who struggled to build their land, and yet did not give up. For example, with the support of KKL-JNF, pioneers planted trees in the desert, drained swamps for agriculture, and built towns and cities. The Israel dream can help developing nations, such as South Sudan, in their nation building, which faces many challenges; it is not industrialized. The road system is underdeveloped and from the rural areas it is almost impossible to transport goods and agricultural products. On the other hand, South Sudan has a great advantage in terms of its water management, something that Israel doesn’t have. The country receives rainfall eight months a year, making it an ideal environment for agriculture. The climate is tropical, and in addition, the soil is highly fertile and idyllic for cultivation. For a fuller report of what is going on, see http://blogs.jpost.com/content/international-development-zionism-and-south-sudan .